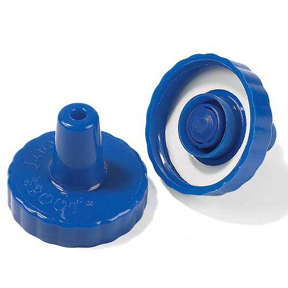 A No Spill Bottle Cap for Juice and Other Wide Mouth Bottles. Finally, there's an effective way to prevent your children from spilling their drinks! This universal spill-proof cap turns any 16 0z. (and up) store-bought plastic juice container into the equivalent of a sippy cup. The special one-piece cap automatically prevents fluid from spilling or leaking,even if the bottle is dropped or tipped over. It screws snugly onto the industry-standard neck of plastic non-carbonated beverage bottles such as Dole, Tropicana, Minute Maid, Gatorade, Ocean Spray, Snapple, and more. The fully automatic valve opens and closes tightly in response to drinking pressure, so it remains closed unless your child is drinking. It is perfect for when you're in the car, taking a walk, eating out, at the gym and more. It's ideal for busy moms, athletes, road travelers and senior citizens! Made of non-toxic, high-density polyethylene. Durable, reusable and dishwasher-safe. Children love to copy their parents, so you can bet that if mom or dad routinely drink from a bottle, they will be asking for it too. This can be an extremely wet and messy endeavors with regular bottles, so many parents are forced to resort to the sippy cup. The Sprout Spout is far easier to use and way more convenient than traditional sippy cups. It allows you to take any 16oz. bottle and instantly turn it into a spill proof drink for your child. Looking for one compatible with water bottles? Then check out the No-Spill Cap Set. A true diaper bag essential. This easy to store device makes drinking on the go quick and easy. Just attach this cap to any store bought juice bottle and you are all set. No more pouring from one container to another, or carrying around bulky sippy cups. Let your kids drink what you drink using the Sprout Spout spill-proof cap. It comes in a convenient two pack so you always have one clean and ready. The Sprout Spout screws onto any 16oz. or larger plastic juice bottle, and quickly renders the bottle spill proof, making it perfect for your little ones. The unique one piece top prevents spills or leaks even when turned upside down, but thanks to it's ingenious design, allows for an even flow when sucked by your child. Use it anytime you’re on the go. It is perfect for strollers, cars, restaurants or anytime you’re out and about . The caps are durable, reusable and non-toxic. Simply remove the cap on the bottle of juice, screw on the Sprout Spout, and you're done! The Sprout Spout is 3 or 4 times smaller than the smallest "sippy cup." This means you'll have to carry a lot less when you're headed out. It is also far safer than sports bottle tops, which pose a choking risk to small children. With a Sprout Spout tucked away in your diaper bag or purse you don't have to worry about what your child will drink if there's a change of plans for the day's activities. Adults love them too. They are great for hiking, biking, jogging, or anytime you're on the go. Great for busy moms, athletes, traveling, senior citizens, and more. Say goodbye to bulky sippy cups and worries about spills and leaks. Order Yours Today! Compatibility Dole, Minute Maid, Mott's, Ocean Spray, Tropicana, Tropicana Twister, Gatorade, Powerade, Apple & Eve, Snapple, Nestea, Aquafina Essentials, V-8 Splash, Vitamin Water, Welch's, Poland Spring, Elements Enhanced Water, 365 Organic, Grower's Pride, Le Nature's, Dasani Nutriwater, Arizona Wateraid, Mad River, Squeezers, Hansen's Energy Water, Enhanced, SmartWater, Clear Fruit, Langer's and more. Sprout Spout - The perfect no spill solution for virtually any wide mouth juice bottle. Give your children the goodness of juice without worrying about the mess. Order Yours Today! For the most part, you can no longer get these individually. They are now packaged with the one for water bottles in a bottle topper set that we carry. It may also be available locally, but we could not say for sure.